For 40 hours, we allowed our readers to choose how much they would like to pay for the magazine, and see how the contribution impacts our operation. It all started with our decision to limit advertising in Works That Work. As simple as that decision may seem, it has a fundamental impact on how we operate because it makes it impossible for us to work with traditional newsstand distributors (who typically take about 80% of the cover price). It affects our pricing as well. WTW’s cover price represents the actual cost of producing the magazine, since our readers are actual investors in the publication, not a set of target data that we sell to advertisers to cover our costs. We weren’t the first ones to explore the idea of flexible product pricing. Best-selling author Robin Sloan wrote an insightful article about selling on the slider. The online game reseller Humble Bundle uses a sophisticated set of sliders to determine a pay-what-you-want price. Offscreen magazine tried it with a periodical, and now we’ve given it a shot too. For 40 hours on February 8–9 we allowed our readers to choose how much they wanted to pay for a copy of the magazine by setting a slider on our website. 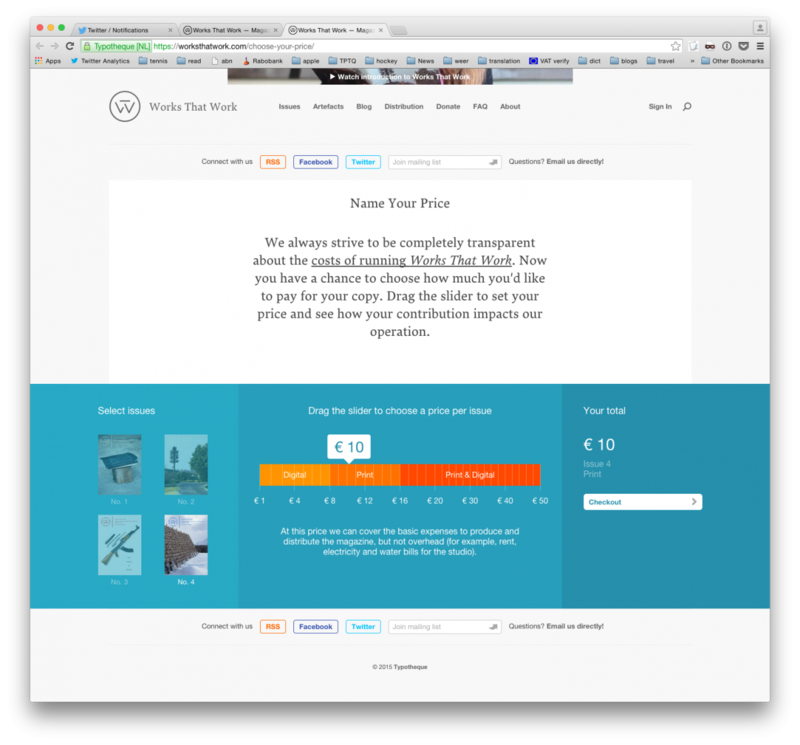 The prices on the slider, each with a comment about how it related to production costs, ranged from €1, (‘At this price, we are deep in debt, unable to pay contributors or cover our operational costs’) to €30 (‘At this price the magazine would be fully self-sustaining, and we could consider making video content as well’). We ran this experiment for a couple of reasons. On the one hand, we’ve always striven to be completely transparent with our reader/investors about how we operate, and this was a good way to illustrate the true production costs and some of the choices we face. On the other, we also hoped that some more hesitant readers who wouldn’t purchase the magazine at full price would take the opportunity to buy it ‘on sale’. And some did. During the 40-hour window we booked 35 orders at an average price of €10.45, a price which is somewhere between the actual production cost of the digital edition (€8) and print edition (€16), and approximately half the cost of the print-and-digital edition (€20). Or as the slider said, ‘At this price we can cover the basic expenses to produce and distribute the magazine, but not overhead (for example, rent, electricity and water bills for the studio)’. This is the free market in action: customers have the power to decide what products succeed, and which do not. In the end, nobody chose to pay more than the normal cover price, and most people chose to pay less*. This is hardly surprising. There is something irresistible about a sale, about the opportunity to get something ‘for cheap’. Also, the kind people who might have chosen to pay more are probably already subscribers (thank you) or patrons of the magazine (a very special thank you). The results of the experiment were: 1) Many people enjoyed it and found it illuminating to see the relationship between the price tag and the magazine operations. 2) We took a loss, but possibly gained new readers and opened a discussion about the economics of the magazine industry. We think the experiment was a success. * Some two weeks after the experiment, we have received an order for 6 copies of the magazine, offering to pay €25 per copy, as this person was unable to process this order at the time of Name-Your-Price action. This order is not included in this overview. Thanks Yves!